The University of Louisville Hite Art Institute is pleased to present “Unseen: Visualizing Ecological Systems,” an exhibition curated by critical and curatorial studies master’s candidate Madison Sevilla. “Unseen” features sculptures and drawings by Stephen Cartwright and Shohei Katayama that explore the intersections between art and ecology. Cartwright’s data visualization sculptures function as self-portraits created through detailed documentation of his life and routines. 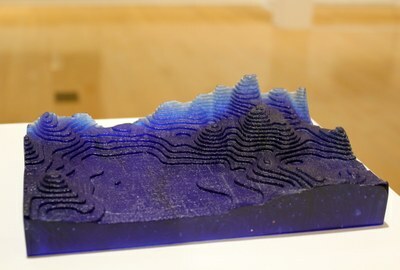 The sculptures contrast graphed data about his geographical location (such as wind patterns, temperature, and precipitation) against his activity levels, forms of activity, and mental health. Cartwright has compiled over 150,000 data sets over the past seventeen years and analyzes various trends to examine the scope of his existence. The artist then renders the data into a three-dimensional illustration. 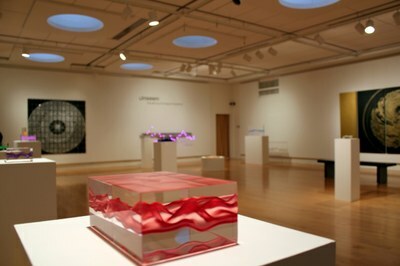 His colorful graphs such as those in his “Floating Data” series are encased in a transparent acrylic while his kinetic sculpture transcribes data into an active oscillating visual form. Katayama’s work is ecologically aware, and he utilizes his drawings and sculptures as a catalyst for environmental conversations. His work examines the underlying patterns and forces of nature by showcasing unseen relationships in ecology. Katayama uses materials like magnets, iron flakes, and oil-based sharpies to create work that embodies the philosophy associated with ecological examination. Through his work, Katayama demonstrates the entanglements that are present between such systems and illustrates the disruptions that can occur when individual components are manipulated. 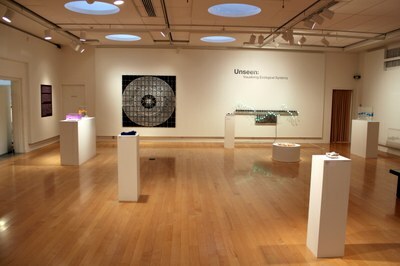 “Unseen: Visualizing Ecological Systems” provides viewers with the groundwork to contemplate the impact on and interactions between the various systems that surround us. Cartwright and Katayama offer up visualizations of the infinite and continuous ecologies that constitute our routines. Stephen Cartwright is an Associate Professor and the Associate Director for the School of Art and Design at the University of Illinois in Urbana-Champaign, IL. He has exhibited work in various exhibitions around the country and works with a range of materials including glass and acrylic resins. Cartwright received a BA in Studio Art from the University of California at Davis in 1996 and his MFA from the Tyler School of Art at Temple University in 1998. Shohei Katayama is a Japanese American artist based in Louisville, KY. 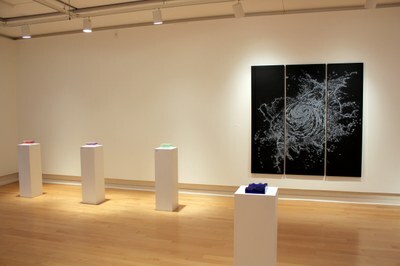 He has exhibited works in multiple exhibitions along the East Coast and works with materials that often play between the organic and inorganic. In 2010, Katayama received his BA from Bellarmine University and is currently working towards his Master of Fine Arts at Carnegie Mellon in Pittsburgh, PA.